Sometimes I visit museums. Often I witness something cool. Case in point, the Ghost Clock at the Renwick Gallery looks surprisingly average. Oh okay, you think, it’s just a grandfather clock with a curtain draped over it. Next. It’s only when you move in close, with a furrowed brow, and realize that it’s all carved from one piece of wood, that you finally appreciate how remarkable it is. Every nuance and every fold was carefully carved from mahogany (from Honduras) by Wendell Castle in 1985. Castle was born in Kansas in 1932, and has often been noted as the ‘father of the art furniture movement’, which until Wikipedia told me, I didn’t know was a thing. Even after staring at the sculpture for minutes, and tracing each shadow and contour slowly with your eyes, you still don’t quite believe it. I’ve seen some amazingly detailed carving work by local artists in places like Thailand and Cambodia, but nothing this realistic. 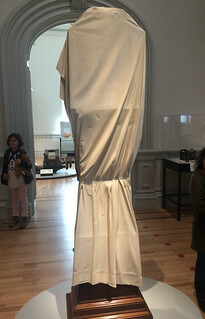 The Ghost Clock is an example of trompe l’oeil (French for ‘to fool the eye’) and came to the Renwick Gallery for their 25th year anniversary (in 1997, the gallery opened in 1972) and remains there still. People can’t get enough. If you haven’t been to the Renwick Gallery, it’s well worth a visit. They closed in 2013 for two years for major renovations and the building’s interior (besides the exhibits and collections) is quite fascinating to walk around on its own. The Ghost Clock wasn’t the only cool thing I saw, maybe I’ll highlight those in the future.